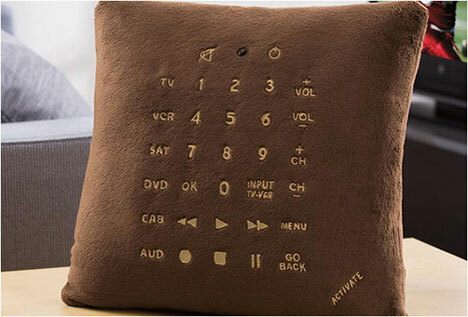 Tired of losing the TV remote between the couch cushions? Getting a little fed up with the stacks of remotes accumulating on the coffee table? This cushion remote is a novel solution to those problems: it’s a plush little cushion that fits right in with the other pillows on your sofa, but it also happens to double as a universal remote control. 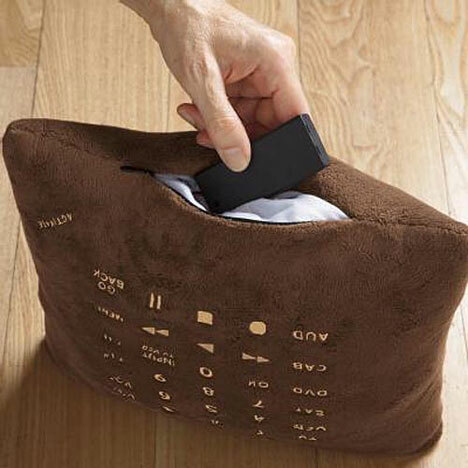 Big enough that it’s almost imporrible to lose but attractive enough that you won’t be embarrassed to leave it out all the time, the pillow remote has codes for controlling more than 500 gadgets. It can be programmed to handle six devices, so your collection of home theater remotes can be condensed into one cuddly little package. The remote is something of a tongue-in-cheek way to deal with a real-world problem. And as far as goofy gadgets go, it’s far more presentable than that singing fish you’ve still got hanging on your wall. See more in Home & Personal or under Gadgets. November, 2010.